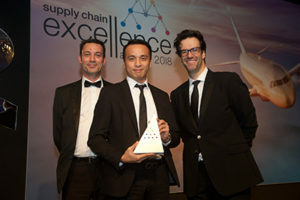 Advanced robotics and AI technologies are starting to transform the way logistics is done, and the winner of the 2018 Supply Chain Excellence Award for Robotics exemplified the way robotics is boosting throughput in parcels operations. Nairn Foster, Akabo Media; Lit Fung, Geek+ and Marcus Brigstocke. China Post’s Wuhan distribution centre has used Geek+ to boost parcels sortation volume has exceeded 600,000 pcs per day. Geek+ is applying advanced robotics and AI technologies to realise high-flexibility and intelligent logistics automation solutions. It’s the first project in China that achieved full-function AGV intelligent sorting technology for the express industry, the first distribution centre to adopt 3D modules for collaborative operations, and simultaneous sorting of large to small sized parcels. China Post and Geek+ fought off strong competition from Swisslog, as well at National Grid, to take the Award, which was presented at the gala dinner in London on Tuesday.